I found this recipe here. My son loved these cookies. The original recipe called for licorice for the mouth, but I didn't have any so I just colored some of the frosting red. As you can tell I did not wait for the orange to set long enough and some of the red ran. My kids still loved them so that was all that mattered to me. In a small bowl, whisk the flour, baking powder and salt. In a medium bowl, using an electric mixer on medium-high speed, beat the butter and shortening until it is well combined. Next add the sugar and beat until light, about 2 minutes. Beat in the egg, then vanilla. With the mixer on low speed, add the flour mixture to the butter mixture until just combined. Scrape down the bowl and mix again until the dough forms. Place the dough in a large ziplock bag and seal bag. Roll out the dough in the bag to 1/4-inch thickness and refrigerate for at least 3 hours. Gently open the ziplock bag and cut away the 2 sides, then peel the bag away from top of dough (as though opening a book). Flip the dough out onto a lightly floured surface and peel away remaining plastic. Cut the dough with a 4-inch pumpkin-shaped cookie cutter and place 4 cookies each on 2 ungreased baking sheets. Bake the cookies until the edges are firm and turning golden brown, 12 to 14 minutes, switching sheets halfway through. Let the cookies cool on baking sheets on wire racks for 5 minutes, then remove cookies to racks to cool completely. To make the icing: In a bowl, combine the butter, milk and vanilla. Whisk in the confectioners' sugar until smooth (icing will be thin and pourable). Transfer about 1/4 cup of the icing into a small bowl; dye with green food coloring. Dye remaining icing with orange food coloring. Spoon the green icing onto pumpkin stems. Spoon orange icing over rest of cookies. 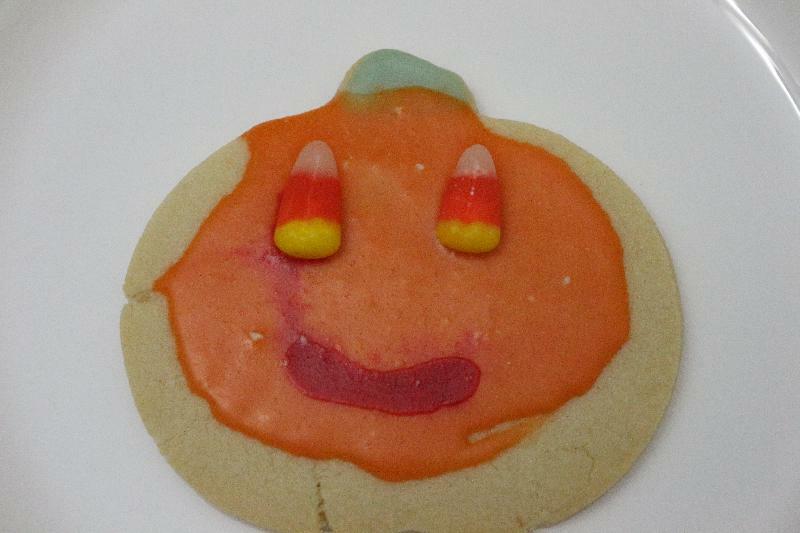 Add candy corn as eyes and licorice for mouths. Let the cookies stand at room temperature for at least 6 hours to allow icing to harden.